Traditional fare and more can be found on the island. 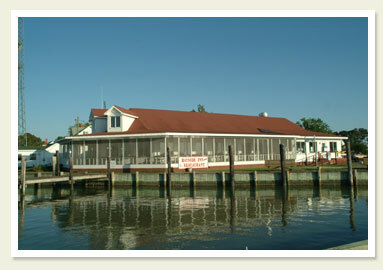 In Ewell, The Bayside Inn is located close to the ferry and the Smith Island Heritage Center. The Bayside Inn also offers hand-scooped ice cream. In Tylerton, the Drum Point Market offers what has been called the best crab cake in Maryland along with sub shop fare. Local Mom & Pop store with the best crab cakes in the land. Grocery store, sub shop and convenience store. Open Monday — Saturday 10-3 pm. Closed Sunday but will open for emergencies or large groups. Check with market for winter hours. Lunch and dinner items as well as an all you can eat family style meal. Gift Shop. Memorial Day weekend through October 15th, 11:00 AM — 4:00 PM. Carryout food and a variety of hand dipped ice cream, shakes, sundaes, floats and more. Take home a Smith Island cake. 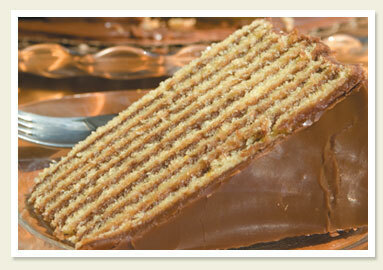 We sell slices and whole cakes.